Join us in the studio on Monday the 27th February for one of our Artist Talk Series with current ELP Artist in Residence, Nica Harrison. Our latest course at East London Printmakers allows you the opportunity to enter into a new world of mark-making possibilities, by learning how to etch the surface of lino with a caustic solution. As well as introducing printmakers to this exciting – and sometimes unpredictable – technique, Steve Edwards will share the methods he uses to register multiple plates in order to create his dramatic large-scale landscapes. The course will take place over 5 evenings throughout March and April, so if you are already a fan of the linocut then this course will give you the opportunity to add an exciting new dimension to your practice. To find out more about the course and book your place, have a little look at this. 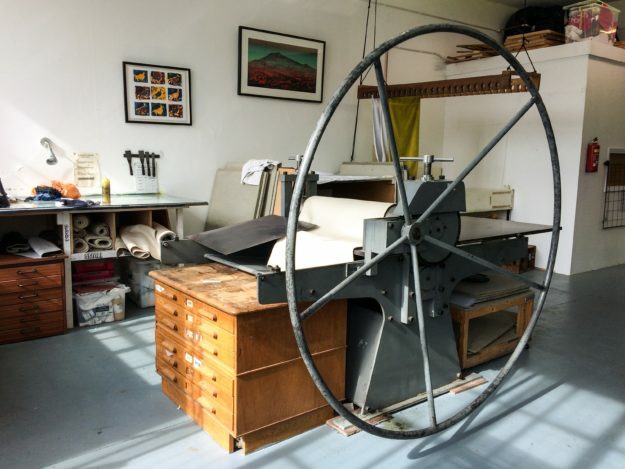 East London Printmakers is a not-for-profit, artist run studio based in Mile End. Our aim is to provide professional and affordable printmaking facilities for artists and designers and to create opportunities for them to discuss and exhibit their work. We offer Open Access for screen printing on paper and fabric, etching and relief and run a variety of courses and residency schemes. East London Printmakers is home to forty seven key-holders, represents over 250 Associates and attracts over one thousand visitors annually. ELP welcome visitors to the studio during open access hours.